Launceston Cake | Launceston Then! 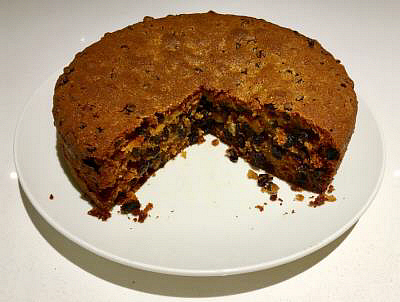 Butter-rich cake made with black treacle, currants, citrus peel and ground almonds. Heat the oven to 180ºC/350ºF/Gas 4. Sift the flour into a bowl to add air. Cream the butter and sugar together. Add the syrup and treacle, then beat in each egg separately, interspersed with a tablespoon of flour. When the mixture is smooth and lump-free, add the remaining flour, followed by the ground almonds, currants and your chosen peel. Bake the cake on the middle shelf of the pre-heated oven for about 1 hours 50 minutes, or until a sharp knife or skewer comes out of the centre clean.